The Version 5.2 release of Wild Apricot consists of the following changes, enhancements, and bug fixes. Previously: After logging in, non-administrative members land on the first restricted page for their membership level unless they have open invoices or are overdue for renewal. Changing to: Administrators can choose where members land after logging in, by selecting a default landing page, and landing pages for specific membership levels. Administrators will still end up in admin view, and members with open invoices will be directed to the Invoices and payments tab in their member profile. 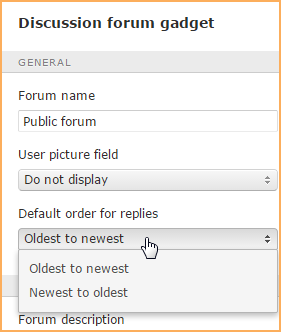 Starting page settings will not apply when a member logs in while registering for an event or to enter a blog comment. Since the starting page settings default to your site's home page, your members will land on your home page until you change the starting page settings. Members can log in to your Wild Apricot site using their Facebook or Google+ credentials. For sites that use the log in form gadget, the option to display these buttons needs to be enabled within the log in form gadget's settings. These buttons will also appear on the Authorization required system page that appears when someone clicks the Login button within a log in button gadget, and at the bottom of each private member profile. To disconnect from your social network without logging off from your Wild Apricot account, click the Disconnect link from the bottom of your member profile. Administrators will still end up in admin view, and m embers with open invoices will be directed to the Invoices and payments tab on their profile. 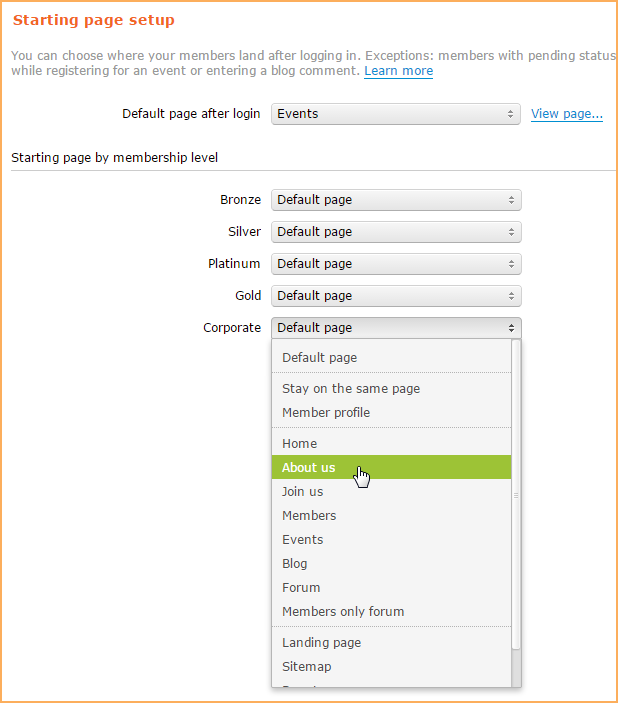 Starting page settings will not apply when a member logs in while registering for an event or to enter a blog comment. 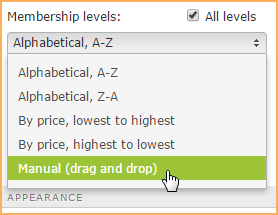 Within the membership application gadget settings, you can sort membership levels alphabetically or by price in ascending or descending order, or choose the Manual option... ...and determine the order manually by dragging and dropping levels within the list. You can set annual renewal periods up to 6 years (previous limit was 3). Option to limit renewal to single period ahead. 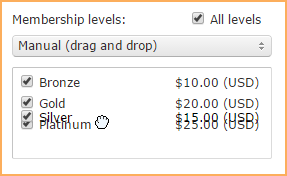 Option to limit renewal to certain period of time before renewal date. Administrators can lock the privacy settings for individual public profile fields so that the settings can’t be changed by the member within their profile. 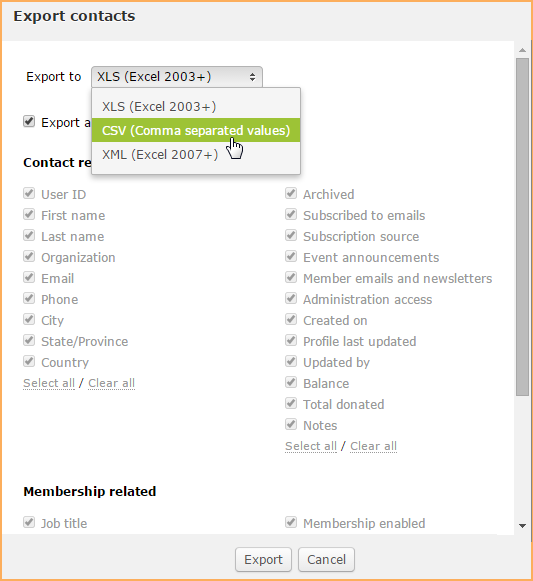 New export formats: XLS (Excel) and CSV (comma separated variables). You can now select the fields to be included in the export file. You no longer have to wait for the export file to be generated – you can switch to other admin screens and receive a link to the export file by email. You can add a site search gadget to allow visitors to search your site for a particular text string. Visitors can filter the search results and jump to any of the matching content. Initially, the search will only be conducted within the content types enabled from the site search gadget settings. Unlike Google searches, Wild Apricot searches can include restricted pages (subject to access permissions) and hidden pages (if this option is enabled). 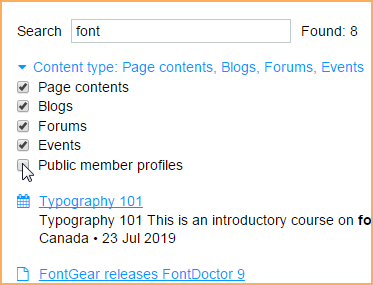 From the site search settings, administrators can control whether events, member profiles, and hidden pages – those not included in your site menu – are included in the search results. By default, they are not included. 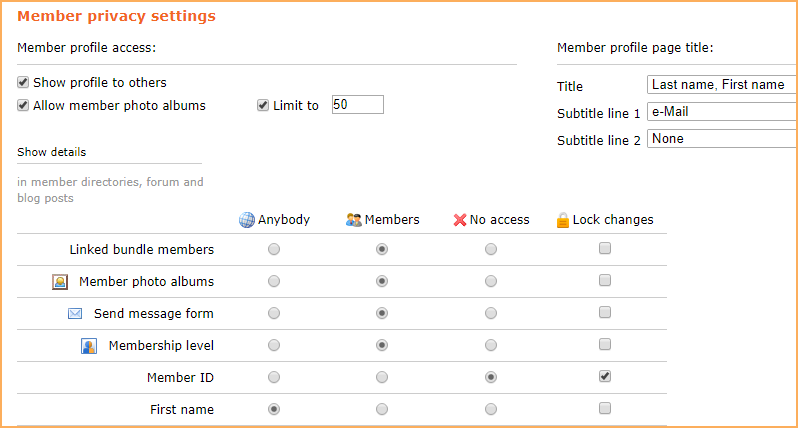 You can now set access permissions for forums by member groups as well as membership levels. If you restrict permissions by both membership levels and member groups, then members will be granted the highest permission assigned to the levels and groups they belong to. 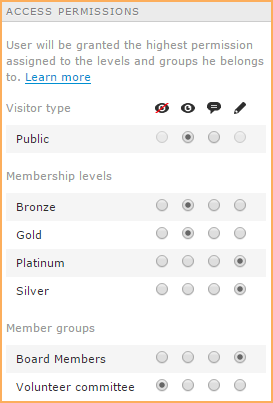 You can now set access permissions for blogs by member groups as well as membership levels. Export registrants across all events within events list so you can report on multiple events without having to stitch together multiple export files. You can now select a specific member as the featured member. You can now choose the label for the link to the member directory page. Ability to manually process credit card payments now supported for BluePay, CRE Secure, Global Payments, IATS, Moneris, PayPal Express Checkout, and PayPal Payflow Pro, as well as PayPal Payments Pro and Authorize.Net. Recurring payments now supported for Moneris. For 2Checkout, another Direct Return option is now supported: Header Redirect (Your URL). The renewal date for multi-year periods was being set incorrectly if there was less than a month between the application or renewal date and the nearest specific renewal date. For example, if the specific renewal date for a 3-year renewal period was January 1st, and a member joined or renewed on December 15th, 2014 the renewal date would be set to January 1st, 2015, so that the member pays the full fee for half a month. Now, t he renewal date for multi-year periods with a specific renewal date will be set to the latest possible date within the renewal period. Using the above example, the renewal date will be set to January 1st, 2017, so that the member pays the full fee for a two year and half month period.